My new favourite television show is Curb Your Enthusiasm. I have long been a fan — and a self-proclaimed expert — of Seinfeld. Most days, I watch it more than once; sometimes, I watch the same episode more than once in the same day. I don’t know why — I know most of the lines by heart at this point — but I never seem to get tired of it. I can answer all the trivia quiz questions and in fact, I think I could make up a few quizzes myself. Somewhere along the way, as I watched, I developed an intense fascination — bordering on a harmless obsession — with Larry David, the show’s star and creator. I had seen the name “Larry David” for years, at the beginning of every Seinfeld episode as co-creator, and at the end — during the first seven seasons — as executive producer. I was vaguely aware of the parts he played as the voice of New York Yankee owner George Steinbrenner, as Frank Costanza’s lawyer, as a news vendor. I knew that he was considered to be the person that George Costanza’s character was based on. Once my obsession developed, I read everything I could find about him, I watched countless interviews and clips from talk shows on YouTube, I checked him out on news reports every day. I was relieved and quite pleased to learn that he’s a pretty nice guy — intelligent, kind, compassionate and, of course, funny. I liked it when I heard that when he was doing stand-up in the comedy clubs, all the other comics who were in the club would gather to hear him do his act. He didn’t really like the audience most of the time — he likes undivided attention and patrons in a comedy club are drinking alcohol and often distracted. One night, he came out, looked slowly around at everyone, said, “Never mind,” and walked off. Knowing everything I’ve learned about him has changed the way I watch — the way I see — Seinfeld and has given it a whole new life. 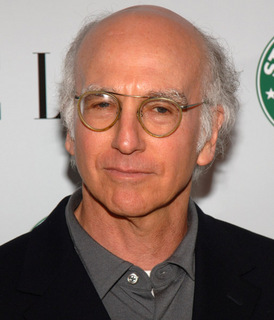 Larry David plays a version of himself in Curb Your Enthusiasm, as a multi-millionaire writer/co-creator of the most acclaimed sitcom in television history — which he is. The episodes are unscripted with each of the characters — some of them playing themselves, others playing a role — being given an outline of what the situation is and they play it off the tops of their heads. He is described in this part as the “reigning curmudgeon of television.” He is a curmudgeon but it’s more complicated than that. He says and does outrageous things. Some of what happens in Curb is truly cringe-worthy. And yet, he usually seems so innocent and vulnerable that it’s hard to hold the outrageousness against him. If he asks a supremely insensitive question, it doesn’t seem that he’s mean or malicious — just that he really wants to know the answer. The answer often annoys him terribly and he expresses his annoyance honestly and openly and quite often, embarrassingly. I don’t know why this should be so funny but it is. It makes me laugh out loud and I assure you, things that are embarrassing and humiliating and cringe-worthy are not my usual sources of amusement. It’s just something about Larry. You can read as much about him as I have — this piece from the New Yorker‘s archives is really interesting and you can watch interview after interview and lots of clips from the show on YouTube. This is the first of a series of interviews about the show and the characters and their methods. They’re interesting and entertaining. An eighth season of 10 episodes is in production now and will be available on HBO in 2011.